The S-Lind Greenway Trail and residential development at 700 East and 2000 South. Taking my dogs running around Sugar House’s main corridors offers a constantly changing landscape. First we run around Sugar House Park; then along the PRATT trail under 1300 East tunnel; we then go around Fairmont Park to the new dog park, then west along the S-Line Greenway to 700 East. Along this route we hear the constant pounding of nails, and sawing of boards, and witness the rise of five new five new residential housing sites. 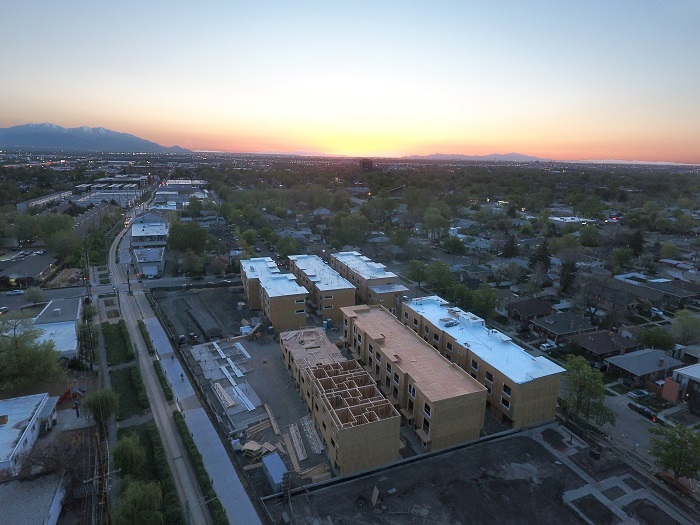 Within a five-block radius of downtown Salt Lake City dozens of blocks have some type of residential construction. The popularity for high-end residential apartments is something new to Utah, and this supply and the demand are changing the demographics of Salt Lake. “I don’t feel like I’m in Utah!” I keep hearing folks say. This out-of-Utah-body experience is due to both the increasing density of infill development and the huge influx of migrants. Attracted here from places like California and the rust belt, easterners are driven away from economies dependent upon coal and manufacturing. They are coming to Utah to be a part of the Wild West and the new technology frontier. Leaders in our State Government understand that we essentially are competing against every other state for investments by Silicon Valley tech companies and if we can offer not only our excellent workforce but less regulation, lower taxes and a better standard of living, people and money will come. And they are coming: from Adobe, Ebay, the NSA, and recently Twitter. Still our Governor Gary Herbert take credit for everything happening. In reality, the building boom occurring in Salt Lake City has been delayed and burdened for years. We are finally catching up to Denver, Phoenix and Las Vegas, which has seen much greater urban building booms than Salt Lake due to their absence of laws that penalize pubs and their customers. It’s my hope that our State Legislature and Governor finally realize that punishing residents for their desire to enjoy a nice glass of wine or craft beer, damages the State’s image, tourism and the natural growth of Salt Lake City. Governor Huntsman understood this, and we have really been enjoying the results of his initiatives now for years. Herbert and the Legislature’s efforts to battle against Salt Lake City from becoming too outdoorsey and instead attempting to steer the branding as the world headquarters of the LDS Church, is truly fighting an unnecessary battle. Salt Lake City can be both. Herbert could have made attempts to keep OR (the Outdoor Retailers Convention) in SLC, instead he choose to take a hardline and tell them to go head a take their things and move to Denver. Still, Utah’s tourism and strong job market are both attracting workers by the thousands, and we need immigrants now more than ever. We have an excellent story in this issue on legal immigration in Utah and the H2B Visa program and how it is used by Red Cliffs Lodge in Moab. This story features attitudes and faces of those who are just happy to be employed under conditions where they are not exploited. If you are new to Utah, whether practicing LDS or not, we pride ourselves in our in both the Pioneer work ethic and our cultural heritage. At Utah Stories part of our mission is to help more Utahns become more self-reliant. And one of the first ways to do this is to grow more of our own food. In Utah not only do we like to grow our own fruits and vegetables (and prep for the inevitable coming apocalypse :), but we also like to spin our own yarn, make our own soap, make our own cheese, brew our own beer and spirits: these are all Pioneer traditions (yes beer and spirits were produced by Mormon Pioneers). Also at the Governor’s Economic Summit was a nice display of Made in Utah product makers. The state is finally recognizing what a great benefit it is to our local economies when we buy and support local product makers. We understand that self reliance should be both a personal and community initiative. Governor Herbert hasn’t yet received the memo on how his corporate welfare initiatives hurt local makers and local economies, hopefully one day he will, and hopefully he will recognize that there is a great overlap in the DIY, can-do self-reliant spirit and traditional Pioneer values. Which brings me to the launch of our annual garden section. Whether you live in an apartment or a home, it’s time to get outside and start growing. Don’t have space? Join a community garden. or grow some veggies in some large pots. It’s truly amazing how much food you can grow even in tight spaces, and we love to show you how. Jump on the self-reliance and DIY bandwagon. Start by using this issue as a guide to get started, and check out UtahStories.com for many more articles on growing more of your own food. All summer long we will have provide articles on self reliance and backyard garden growing along with blog posts and videos on our own Utah Stories office garden.